In the bowl of a food processor, combine 1 3/4 cups Delinut cashews with canola oil, and process until smooth, 5 to 7 minutes. (You should have about 3/4 cup puree.) Set aside until completely cool. 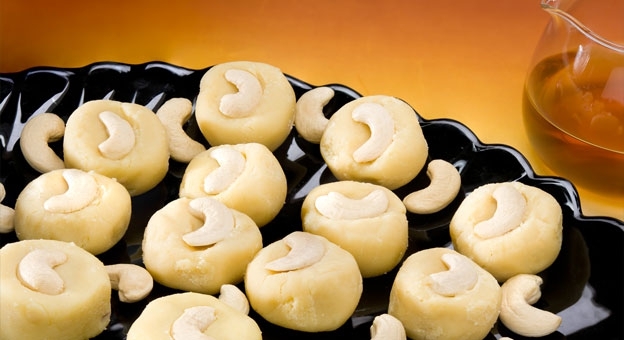 Coarsely chop Delinut cashew nuts, and reserve for garnish. In a medium mixing bowl, sift the flour and salt together; set aside. In the bowl of an electric mixer fitted with the paddle attachment, combine the butter,Delinut cashew puree, and both sugars, and beat on medium speed until light and fluffy, about 2 minutes. Add the egg and vanilla, and mix until well combined, about 30 seconds. Add the flour mixture, and mix on low speed, just until combined, about 20 seconds. Wrap dough in plastic, and refrigerate at least 1 hour. Preheat oven to 350 degrees. Have ready two baking sheets lined with parchment paper, and set aside. Scoop 2 tablespoons of dough (1 1/2 ounces), and shape into a ball. Transfer to prepared baking sheet. Repeat with the remaining dough, placing dough balls 3 inches apart. Dip the tines of a fork in flour, and press into the dough balls to make vertical and horizontal indentations. Sprinkle reserved Delinut cashew nuts on top. Bake 10 minutes. Rotate baking sheet, and bake 6 to 8 minutes more, depending on whether a soft or crisp cookie is desired. Transfer cookies with the parchment to a wire rack to cool. Store in an airtight container at room temperature up to 1 week.